Fashion In The Forest: The Spring Fashionista Look Book Is Here! Take A Sneak Peek At The Largest Fashion Event On The Internet! The Spring Fashionista Look Book Is Here! Take A Sneak Peek At The Largest Fashion Event On The Internet! Take a deep breath! It is the internet’s largest and only ALL FASHION, ONLY FASHION related giveaway blog giveaway EVENT. Taking place March 2-7, every giveaway in the event will be valued at $100 – or more! It gets better. Since are more than 110 bloggers participating that means there will be more than $20,000 worth of prizes to win--many giveaways are over $300! To get you even more excited, the LookBook will give you a sneak peak at some of the giveaways that will be offered during the event. Flip through the pages and find the numerous gift cards that will give you a well-deserved shopping spree. Or maybe jewelery is more your style. No problem. There are hundreds of dollars worth of baubles to adorn your ears, wrists and neck. Plus, you could win a new pair of jeans or a design-your-own dress. And what fashion giveaway would be complete without a number of trendy purses? Feast your eyes on the possibilities! 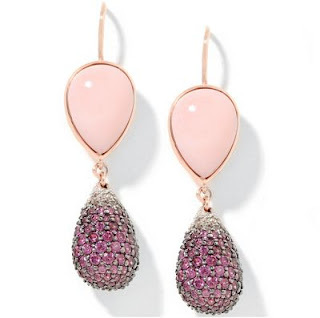 And if all of this wasn’t enough… The Fashionista Events LookBook is offering you the chance to win your own pair of Pink Opal And Gemstone Rose Vermeil Drop Earrings by Rarities: Fine Jewelry with Carol Brodie. Thanks Carol for being our Lookbook Sponsor for the Spring Fashionista Event! The earrings are pear shaped pink opal (3. 92 Cts), round Rhodolite, and round White Topaz and retail for $279. They are show-stopping stunners and they could be yours! Enter using the Rafflecopter form below!! The Spring Fashionista Giveaway Event is the amazing brainchild of The Chief Blonde at Still Blonde After All These Years. Her co-hosts for the event are Katy Rose of ModlyChic and Ellen of the Socialite’s Closet. Mark your calendars for March 2-7. It’s going to be an incredible event! Also, visit our Grand Prize Sponsor, Bella Bags, who is donating $1200 (retail) Marc Jacobs Bag as the Spring Fashionista Events Grand Prize!